The Skateboard Mag has a rad edit of Aaron "Jaws" Homoki shredding Paradise Valley Skatepark in AZ! Go to Ride Channel to find out how you can win 7 different items from Pig Wheel and Nick Merlino! The bro's shred Insanity Skatepark in episode five! The new Toy Machine "Amigo" pro series features P2 Technology to enhance your life...and pop. Daniel Lutheran shows his homies good spots and good times in his hometown of Albaquerque. Read this Ben Karpinski article for more Querque action. Matt Bennett is featured on the Skateboarder site along with a few other Tum Yeto riders. Foundation Flow Bro Joey Ragali is featured in Daniel Lutheran's Albuquerque Vacation over at ESPN. Tim Tim films lines for days at Cherry Park. Dakota Servold continues to shred.....this time you can see him over at Burnout. Congratulations to the winners of the #foskcofoto Instagram photo contest! Thank you to all the skateboarders for their submissions. 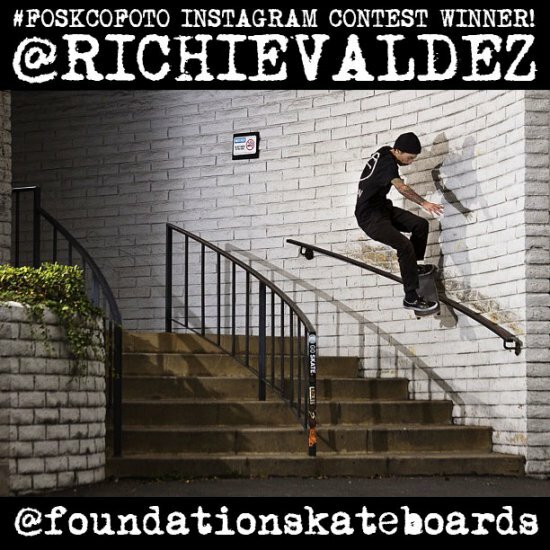 Continue to tag your skate Instapics #foskcofoto for chances to win free product every month! The Dekline Footwear team filmed a Park Crasher edit at Active Ride Shop HQ. Chad Tim Tim, Nick Merlino, Ryan Spencer, Dakota Servold, Blake Carpenter, Jeremy Leabres and Joey Ragali. JT Aultz and Corey Duffel's 2012 Japan Trip from Osiris Shoes Network on Vimeo. Skateboarder Magazine photographer John Bradford has a couple of film out takes of Collin and Dan Lu from the “Zen and the art of Cat Hearding” Toy Machine article...view it in it's entirety here! Provost dips his Barley grind in North Cacka chrome. Boo yes. Photos of Dan Lu and Collin on Skateboarder. Posted December 4th, 2012 by Where Are You On All This? Have a #loyalpawnsxmas and inject Toy Machine with your holiday #toymachinesocks photos to win lots of free product. Come join the neighborhood of Cherokee Point and the larger City Heights community as we rally and advocate for the creation of a skatepark.